Maria Drozdovskaya wants to know what our „astrochemical ancestral tree“ looks like. The incoming Fellow of the Center for Space and Habitability (CSH) at the University of Bern has just won a prestigious award that she will bring to her new host institution: The Gruber Foundation (TGF) Fellowship. It is one of the oldest and biggest science questions that motivates Maria Drozdovskaya’s work: Where did we come from, what is the origin of life on Earth? 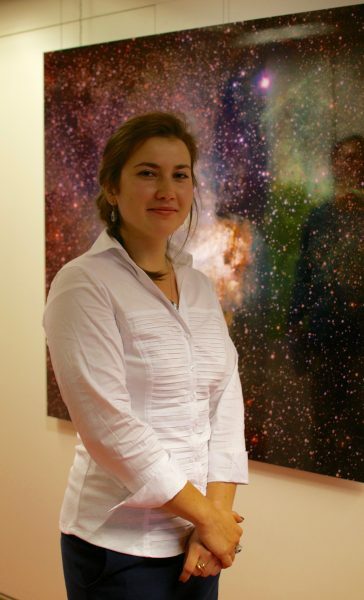 “I perform computer simulations to follow the trail of certain molecules through various stages of star and planet formation,” the young researcher explains. Astronomical observations have been showing that space is filled with various molecules and even some very large complex molecules that could be the simplest building blocks to life. „I want to pinpoint the conception of biologically-relevant molecules in order to understand our chemical heritage and interstellar roots,“ says the astrophysicist. Maria Drozdovskaya is about to finish her PhD at Leiden University and will start working at the University of Bern in November not only as a CSH Fellow but also as a TGF Fellow. This is an award given out by the International Astronomical Union (IAU) to fresh PhDs to bring to the host institution of their first postdoc or fellowship. Since 2007, only 12 recipients of the TGF Fellowship have been named by the IAU. “I couldn’t stop smiling once I heard the thrilling news,“ the winner says: „I consider it a great honour for my work to be recognized at such a competitive international level.“ But she also admits: „I specifically targeted the TGF Fellowship, since it provides an excellent opportunity for me to kick start my independent research career at the CSH on an interdisciplinary topic.” Her TGF Fellowship amounts to US$ 25’000 and is given as a stipend covering travel, subsistence and research expenses supplementing a postdoctoral appointment at the host institution.